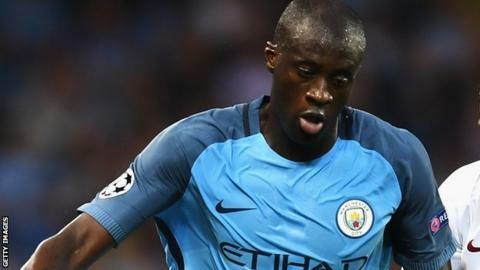 Manchester City manager Pep Guardiola says he will not pick Yaya Toure until his agent apologises for criticising the decision to leave the player out. Toure, 33, has made one appearance for City this season and he was left out of the Champions League squad. His agent, Dimitri Seluk, claimed the midfielder had been "humiliated", and Guardiola said: "Seluk must apologise. If he doesn't, he [Toure] won't play." But Seluk told BBC Sport: "What do I need to apologise for?" He added: "He should speak to Yaya. Yaya is doing his job. "We will see what happens. His contract expires at the end of the season and in January he will be free to go." Guardiola, who was Barcelona boss when Toure was sold to City in 2010, said of the player: "It was so difficult for me to put him out of the Champions League, so difficult. I know him, I know he's a good good guy. "But the day after his manager [Seluk] spoke. In that moment Yaya is out. "I cannot accept as a coach, when his player doesn't play, going to the media to speak and speak and speak." He said Seluk did not have the "courage" to call him but said Seluk could always apologise via the media. "When that happens Yaya will be part of the group and he will have the same chance to play all the games." It is understood the first Toure knew of his manager's stance against playing him was when he announced it at Tuesday's news conference. Guardiola was speaking soon after Toure announced his international retirement. Having made his debut for the Ivory Coast in 2004, Toure won 113 international caps, winning the Africa Cup of Nations in 2015. "Writing this note was probably 'the most difficult match of my life'," he said in a statement. "After 14 years at the highest level, I'm sure this is the right time for me." Meanwhile, City captain Vincent Kompany could make his first appearance of the season in Wednesday's League Cup third-round tie at Swansea. "He has trained a lot and he will be ready and be part of the group and compete with other central defenders to win his position," said Guardiola.